Language and literacy development are central to students’ intellectual, social, cultural, and emotional growth, and are thus seen as key components across the curriculum at RMS. We believe that when students learn to use language, they do more than simply master basic skills – they learn to value the power of language and to use it responsibly; they learn to respectfully express feelings and opinions and to support those opinions with sound arguments and evidence from research. Essentially, then, a primary goal at RMS is to develop language and literacy skills, whereby learning to communicate with logic, clarity and precision will help students to not only achieve academic success, but also thrive in the world beyond school. To thrive in today’s digital age, young people must develop competencies vastly different from those required of us in the past – in all reality, the young people of today are being educated for an unpredictable future; they are essentially being trained for careers which are yet to be imagined, let alone to exist. With this inspiring, yet somewhat daunting reality in mind, it is increasingly important for us educators to facilitate what educational literature is calling the development of 21st century skills, namely, critical thinking, creativity and innovation, and above all else, perseverance. It is in the face of this unprecedented reality that we turn to language and literacy development here at RMS. 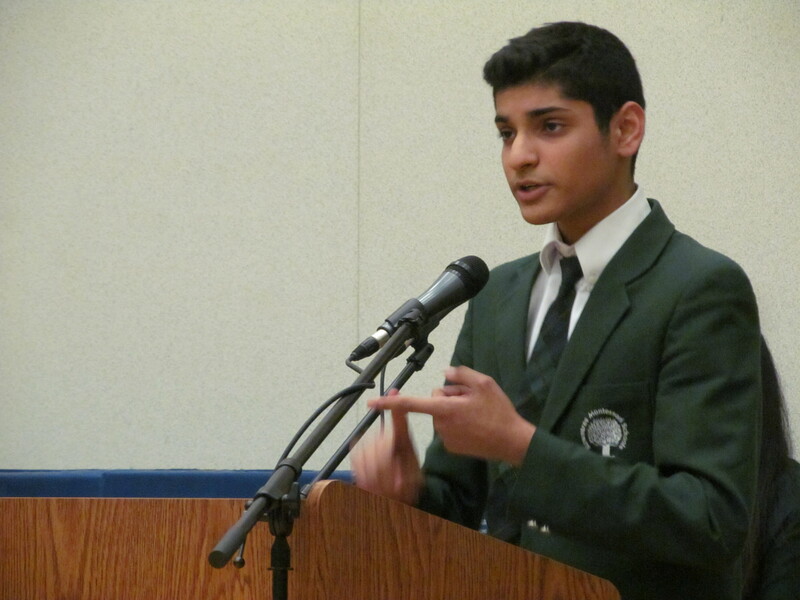 On March 3 and 4, in addition to the traditional orations done heretofore at RMS’s annual Speech Night for Grades 1-6, which require avid research, writing and oral communication skills, our Grade 7 and 8 students were further challenged by having to take a position on a controversial or arguable topic and clearly, logically and persuasively support that position in the context of a debate. RMS parents, teachers and administration congratulate all of our students for their diligent efforts to develop well-written compositions and to deliver them with confidence and pride, but moreover, we feel inspired about what participation in this literacy event, among the many others underway at the Academy, will mean for the future of our young people. Debate is essentially “critical advocacy.” It is advocacy in that the debater must advocate, propose, and defend ideas. It is critical because the debater must not ignore the advocacy of others, but must engage them and use the tools of critical thinking to evaluate the ideas of others. This process of critical advocacy has been shown to involve students in important behaviours, skills and emotional intelligences that we strive to cultivate in Rowntree’s citizens of tomorrow. Debaters become better critical thinkers and communicators. Debaters improve their social interactions and personal expression. Debaters develop the capability to confront the seemingly infinite volumes of information on any topic and select relevant data. Debaters become creative problem-solvers who can “think on their feet” to bring existing information to novel situations. Debaters develop the comfort of working with others and knowing when to lead and when to follow. 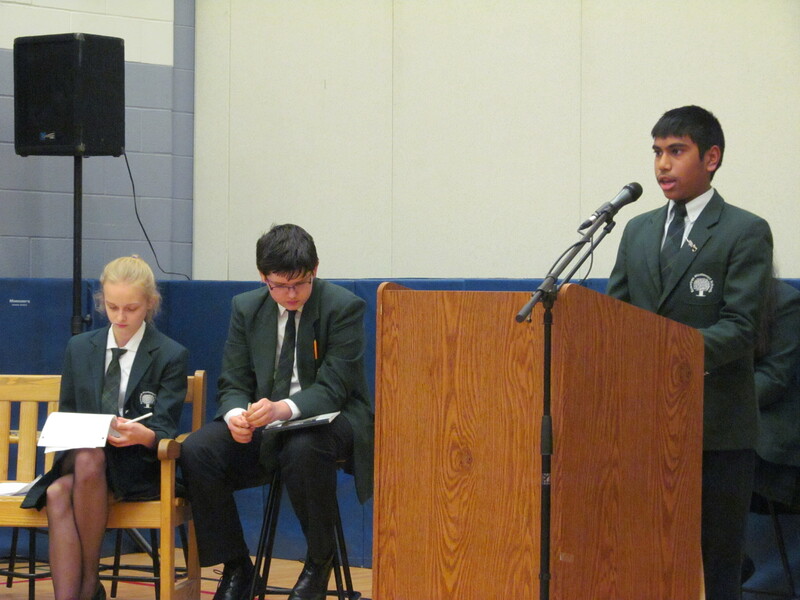 Debaters develop the capacity to persevere through setbacks. Debaters tend to become citizens in the real sense of the word – informed, active, participating, a force to be harnessed for the betterment of all. We invite you to please drop by any of our campuses for a personal tour anytime Monday-Friday 9:00am-3:00pm. If you prefer, call to book an appointment for a personal tour anytime Monday-Friday 9:00am-3:00pm. 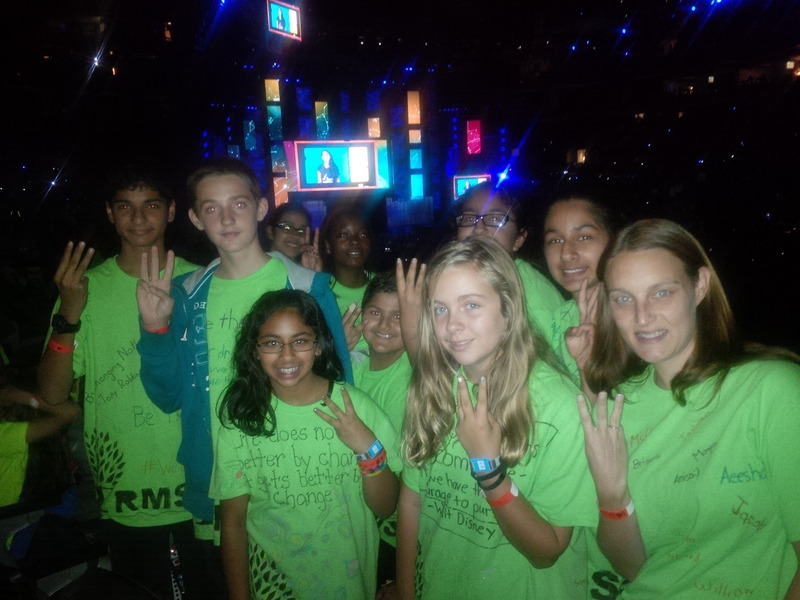 RMS Festival of the Arts 2015 – Huge Success! Rowntree Montessori Schools’ Academy hosted its 9th annual Festival of the Arts on February 17-19, 2015. Over the three days, students’ art work was on display throughout the hallways. All students from Grades 1-8 participated in an art competition. Anonymous judges from outside the RMS community with an artistic background were invited to judge the pieces and award ribbons. Parents were delighted by all the artistic talent on display. Well done, everyone! In addition to the art show, audiences were treated to an array of student-created performances at the Festival of the Arts Talent evenings. The show was filled with singing, dancing, instrumental pieces, and drama skits by students from Grades 2-8. Even the teachers showed their school spirit with a dance routine of their own. Please enjoy our highlight reel! A great time was had by all — we hope you’ll join us next year! Why does RMS believe it is important to learn French? Very often students think that French is not something that they will use in the future, and stop prioritizing it as an important and valuable subject. Little do they know that those who study a foreign language earn increases in their performance of math and reading, and even their language arts test grades are considerably higher than those who don’t learn another language. Let’s look at a few of the extensive benefits of learning French as a second language. Speaking a new language helps you get to know different people and exotic cultures, but surprisingly they have more in common than you think! Learning cultural literature, film, and music in the original language will expand a person’s knowledge and creativity, including the historical relevance of where it is now. Additionally, contrary to English, the French language distinguishes between tu (familiar) and vous (formal/plural). The fact that many languages have both the familiar and formal way of saying “you” indicates that most cultures place a great emphasis on being courteous and polite when need be. Speaking more than one language is a skill which will increase your marketability. Employers tend to prefer candidates who speak one or more other languages because it opens up business opportunities and transactions with a wider range of clients. Someone who speaks French will especially have an advantage over someone who doesn’t, so it’s key to know how to improve yourself to be even more successful. Learning another language can help you to understand your own. When students learn any grammar or structure of another language, they understand it through the prism of their own language. In order to learn new things in French, the students ascertain the knowledge of their own, which clearly shows them connections between the two. Children who study another language often have higher standardized test scores in math, reading, and language arts. Additional language study can help to increase problem-solving skills, memory, and self-discipline. If you are a native English speaker, one of the best reasons to learn French is to help you understand your own language. For those whose English is not their first language, you have double benefits: learning English and French at the same time! To summarize, contrary to common misconceptions, learning French is just as important as learning math or language arts. People think that just because a student won’t need French in the future, it’s useless to acquire it now. But even though it might not seem like it’s affecting them that much, it brings a lot of benefits, presently-stretching their thinking and helping them to do better in all other subjects. “There is a lot of research that confirms that learning a second language gives a boost to their brain.” said Betty Gormley, the Executive Director of the Ontario branch of Canadian Parents for French (CPF). She also pointed to data that links language education with improved cognitive development in young students. Who said a student needs mathematic equations and learning how to solve trigonometry in the future anyways? Just like math expands logic in the mind, a new language opens up activity in the brain, trains your memory and magnifies skills. At Rowntree Montessori Schools, students are given a “head start” in French Studies , as they begin to study in the Core French Programme during their Junior Kindergarten year. Click here for more details. 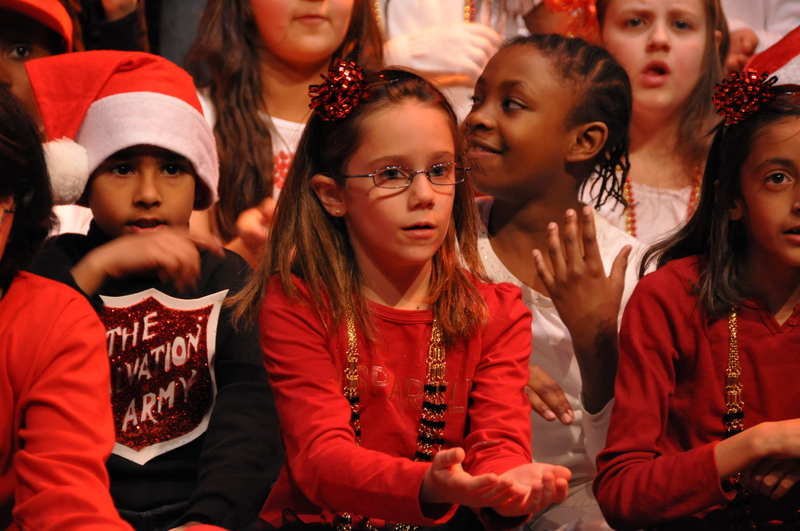 The children’s performances create lifetime memories for both the child and their parents. As the joy and cheer of the holidays fill the air at Christmas, our students at all Rowntree Montessori Schools campuses prepared themselves with great pride and enthusiasm to showcase their vocal talents and rhythmic moves. It is a time of year when every student is a star! But the road to stardom is sometimes a trying one as some of our precious little ones blossom with careful nurturing and motivation to become confident young performers. It is events such as these that make Rowntree Montessori Schools so special and a much sought after private school, as we strive to encourage even our tiniest friends, the toddlers aged one, to get in the spotlight and move to the music. This is the perfect opportunity for our students to build their self-confidence and find that hidden talent which some of them don’t even realize exists within them! These concerts open the doors to students who have strong oral skills, for it is their turn to shine as they share their passion and creativity with their peers to showcase some truly awesome talent. As the final countdown to show time takes place, it is indeed amazing to see the confidence oozing out of a once shy performer. Dress rehearsals are the perfect time for our students to sit back and enjoy the preview of the golden night which unfolds in the days to follow. From music to costumes and props, the concerts at Rowntree are a crystal clear reflection of a growing passion for the arts as well as the dedication and commitment of both our students and their ever supportive parents, who are undoubtedly and wholeheartedly part of the wonderful Rowntree family and whose valuable contributions help us to mould a potential Broadway star or even a future Oscar nominee! Bravo to all our budding stars! Rowntree certainly has got outstanding talent. Another memorable Brampton Santa Claus parade. We are delighted to announce that Rowntree Montessori Schools’ (@RowntreeSchools) float was awarded the 2nd Runner-up for the Chairman’s Award-Best Overall Entry in the Brampton Board of Trade (BBoT) 2014 Santa Claus Parade. We thank the BBoT Santa Claus Parade (@BramptonSanta) Judges for recognizing the devotion and meticulous detail that went into creating our ‘Frozen’ entry. Also, a HUGE THANK-YOU goes out to all those who took the time to vote for us as their Fan Favorites’ – we gathered enough votes to be in 2nd Place! Our “Frozen” entry portrayed a large blue-backlit ice castle and a number of other elements from the movie “Frozen” as well as Princess Anna and Snow Queen Elsa, Kristoff, Hans, the charming Trolls, the beloved reindeer Sven and of course Olaf, the friendliest snow man. Our students and staff thoroughly enjoyed participating in the parade as they were dressed as the mentioned characters while singing and dancing to a number of songs such as ‘Let it Go’ along the parade route. Our marchers, dressed as snowflakes, performed a number of dance routines, sharing the good cheer, excitement and spirit of the season with the crowd along Canada’s largest nighttime parade. Our sincere appreciation and thanks goes out once again to our sponsors Moore Brothers Transport, Long & McQuade, RONA and McCarthy Uniforms for their support. We congratulate Hi-Lon Glass on winning the Chairman’s Award for their innovative Snow globe Float and Brampton Hydro (1st Runner Up to the Chairman’s Award) for their creative Flintstones Christmas entry. We are thrilled to announce that Rowntree Montessori Schools has been awarded TWO Platinum 2014 Readers Choice Awards!!! We truly appreciate the recognition from the Brampton Guardian Readers for once again voting Rowntree Montessori Schools Brampton’s BEST CHILD CARE as well as BEST PRIVATE SCHOOL. A GREAT BIG THANK-YOU, Brampton!!! RMS would like to THANK all of our wonderful families for the trust and faith you have in our Schools and for entrusting us for the past 45 years with your most cherished treasures, your children. Since 1969, Rowntree Montessori Schools’ teachers pride themselves on their caring and stimulating approach towards teaching as the school’s motto “Nurturing Tomorrow’s Achievers” implies. Our small class sizes allow for teachers to develop a close working relationship with our students and their parents in a motivating and friendly atmosphere while addressing the individual learning needs and styles of each student. Conveniently located throughout Brampton, Rowntree Montessori Schools (RMS) offers five campuses, each one designed and structured to suit the needs of its students, from the age of 12 months old to Grade 8 inclusive. Rowntree Montessori Schools is the largest and longest serving Montessori school in Brampton as well as a GOLD Level member of the Ontario Federation of Independent Schools. For more information, call 905-790-3838, visit www.RowntreeMontessori.com, or just drop by any of our campuses for a personal tour anytime Monday to Friday between 9:00am and 3:00pm. If you prefer, call to book an appointment for a personal tour anytime Monday-Friday 9:00am-3:00pm. The choice is difficult, and the outcomes are vitally important, so just what are the factors that encourage parents to choose private schooling for their children? Amongst the most common reasons cited by parents are: safety, small class sizes, and consistently high teacher dedication and communication. These combine, in many cases to allow parents to feel entirely confident that their children are in good hands, while they go off to attend to the other demands of their very often busy day and lifestyle. Also, as the very nature of “family” evolves, it seems to help to have the support of a private school administration, teaching, and office team to assist in attending to the plethora of needs for the child. Current families include dual income, single parent, stay-at-home dads, extended families, and actively engaged grandparents, and as the definition of the family evolves, so too does the importance of a more personal connection with the school. In addition to close relationships and communications, many parents are drawn to private schools by the wide variety of extracurricular and extended hours options. These allow added choice in helping families to tailor their own needs and schedules with a second “home base”, rather than requiring additional transportation and care giving arrangements. More and more, private schools are offering a “one stop shop” and staff members are bringing much more than their classroom skills to school, to offer value-added athletic, artistic, culinary, and technical programs. Let’s not forget every parent’s concern for the quality and challenge of their child’s academic program. Private schools meet, and most often exceed, the Ontario Ministry of Education’s program expectations. Small classes allow a more individualized set of challenges for each student, and the option of enrichment or remediation as required. While not required to do so, many private schools also take part in external testing such as the Canadian Test of Basic Skills, and also compete in such challenges as the Canadian National Mathematics League and the Model United Nations, in order to ensure that they are measuring up well with others across the country. As well, a strong focus on educational technologies is a key feature of private schools, as the most up-to-date equipment in the classrooms will better prepare children for their future learning and careers. It seems as though virtually every career on our children’s list of aspirations involves some aspect of technology, along with the requirement for a level of comfort in learning about the technical aspects of a new position. Is a private school right for your child? Why not at least visit and acquire the information to make an informed decision? See you at school! – The enthusiasm in the atmosphere is thrilling. It’s the Robotics Club time to shine, and the students have a hard time containing their excitement on competition days after hours of designing, building and testing their creations! The students of Rowntree Montessori Schools’ (RMS) FIRST® LEGO® League Robotics Club use Lego blocks, computer controllers and motors to program and control their creations to complete a number of different challenges. After breaking down the challenge into logical steps, students use their math skills to calculate angles, distance, revolutions and turn radii to position the robots. Then of course there are the hours of scientific testing and recording to ensure the robot consistently repeats the same manoeuvre every time. What better way to turn learning into resolving real world problems? In order to complete the challenges, students are required to work as a team using Science, Technology, Engineering, and Mathematics (STEM) skills as well as communication and scientific problem solving skills to devise a working solution. Students are presented with a list of objectives that they can perform to gain points, such as rescue a stranded victim and deliver them to a designated safe zone, or transport vital supplies and equipment. Students then design and program autonomous robots to complete these objectives using the Lego blocks to create robotic arms and sensors to perform these tasks. This is exactly the type of skills students will need for the future. We don’t know what types of jobs will be available for these students when they graduate, but we do know it will include new technologies. The students we are teaching today could become “Localizers” or “Simplicity Experts”, developing new ways to improve the future work environments. The skills and knowledge students are learning at RMS today will help them prepare for some of the future jobs suggested by The Canadian Scholarship Trust careers of 2030. As stated by Davies, Fidler, and Gorbis “Workers in the future will need to be adaptable”. Not only will they need Computational Thinking, but they will also need to be able to develop novel and adaptive thinking skills as stated in their Future Work Skills 2020 report. After the FIRST® LEGO® League (FLL) competitions, the students are motivated to work even harder to excel. With one of the RMS teams recommended for two award categories and another one which advanced to the Ontario Regional and Provincial Robotics competition finals after receiving an award for their programming skills, hopes are high for even better results at next year’s competition. 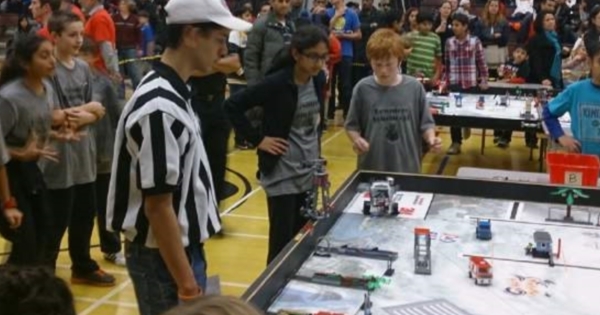 As if competing in the regional qualifiers against 35 teams and then progressing to the FLL Ontario Provincial Championships West held at the University of Waterloo to compete against 41 of Ontario’s top teams isn’t enough! This year’s theme was Nature’s Fury. The FLL robotics competition is composed of two elements: part robot development and part research project. The research project involves coming up with an innovative solution to solve a real world problem. Our Innovation Stars Team chose Typhoon Haiyan as their topic because it was a severe disaster which occurred shortly before they entered into the competition. Their project was about giving the people in the Philippines food, clean water, and shelter. They wanted to help address the emergency needs because many problems resulted from the disaster and the people affected need a lot of support to help them get them back to normal life. To that end, they brought an increased awareness of the typhoon and its victims to our community by making and displaying posters, writing an article in our newsletter and making rainbow loom bracelets which they sold to raise funds which they donated to the Red Cross. With respect to the robot development part of it, these students want to show what they are capable of doing by designing innovative solutions such as inexpensive mechanical early warning systems and using creative programming techniques to accomplish precision manoeuvres and obstacle avoidance. Their solutions resolved simulated circumstances such as clearing a path for emergency vehicles, clearing a runway for planes to land, and helping to get people to safety. In the Regional Competition, they placed 6th out of 35 teams. In Provincials, they placed 25th out of 41 teams. When students are given the tools they need, it is amazing what they can achieve… another great example of RMS “Nurturing Tomorrow’s Achievers”! RMS will be hosting a Robotics demonstrations & competition on Tuesday June 10th, 2014 (6:00pm) at the RMS Academy Campus. To learn more about the RMS Robotics demonstrations & competition, click here. Unable to attend? Please drop by any of our campuses for a personal tour anytime Monday-Friday 9:00am-3:00pm. If you prefer, call to book an appointment for a personal tour anytime Monday-Friday 9:00am-3:00pm. We encourage you and would appreciate it if you kindly SHARE this post with others if you enjoyed it by clicking onto one or more of the icons below. Thank you. One of the greatest challenges a teacher can face while instructing a class full of diverse and unique learners is to captivate the interest of each child, and deliver lessons in a meaningful way that ignites each students’ learning preference. During our most recent Professional Development day, our staff members attended a workshop regarding the many different styles of learning a child is capable of encompassing. Interestingly, both conveners of the workshop are teachers of different divisions (i.e. primary and secondary) here at Rowntree Montessori Schools. With that said, both teachers agreed on witnessing variations of each learning style amongst their class of learners regardless of their grade level, ability, or age range. Seeing how RMS focuses on Maria Montessori’s philosophy of education, where each child is encouraged to explore his or her learning environment independently and from a student-centered approach, the conveners of the workshop believe that understanding the different learning styles of each child will help promote overall learning and student achievement. The workshop included the work of Howard Gardner, a prominent American Developmental Psychologist, who believes human beings possess at least 8 distinct forms of “intelligence”. 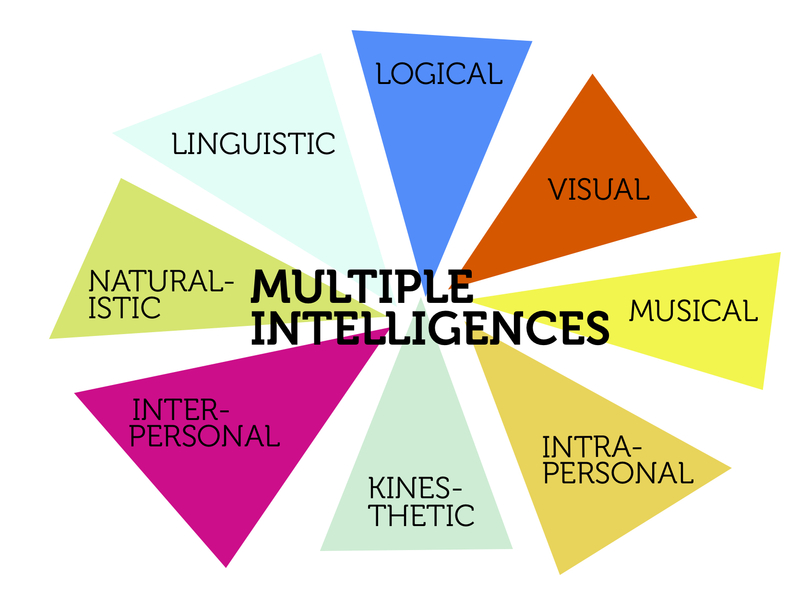 Further, Gardner believes each person has a unique blend of the 8 intelligences, and each manifests itself at varying levels. The staff at RMS encourage you to take Howard Gardner’s Multiple Intelligence Test to determine what kind of learner you are. 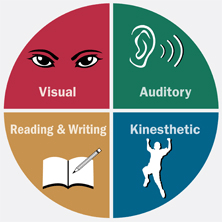 The staff at RMS strives to reach the unique learning styles and needs of each student to ensure that all learners are able to both learn and demonstrate their learning in a way that best suits each individual. We have found that our best option as teachers is to use a variety of teaching techniques to give all students the best chance to succeed. More details about Rowntree Montessori Schools’ approach to education can be seen by clicking here. Please drop by any of our campuses for a personal tour anytime Monday-Friday 9:00am-3:00pm to learn more about the RMS private school community of which we are so proud. If you prefer, call to book an appointment for a personal tour anytime Monday-Friday 9:00am-3:00pm. Please SHARE this post with others if you enjoyed it by clicking onto one or more of the icons below.